The many benefits of Natural Soap just begin with Aromatherapy! We make 45 natural soaps for you to select from, each made using 100% natural essential oils. More and more people are becoming aware of the negative effects of synthetic additives in commercial soap. Sodium tallowate, sodium cocoyl isethionate, sodium cocoate, sodium laurel sulfate, water, sodium isethionate, stearic acid, coconut fatty acid, fragrance, titanium dioxide, sodium chloride, disodium phosphate, tetrasodium EDTA, trisodium etidronate, BHT, FD&C blue no. 1, D&C red no. 33. Or this way, the way a true natural soap lists ingredients: Olive, Castor, Coconut and Palm Oils; Sodium Hydroxide; Mountain Spring Water; Goat Milk; Lavender Essential Oil. Because of all these multiple syllable words that most of us can’t pronounce, many people are turning to all natural soap. It’s important to learn the basics of natural soap, though, so you can read the ingredients listed on all products and separate the truly natural from those pretending to be natural. The addition of one or two natural ingredients does not make a product "all natural". This growing demand for truly natural soap is what has created the new opportunities for handmade soap makers to provide natural soap and specialty soap to the market. We have sold our natural soap ‘naked’ or unpackaged since we began making soap in 1998. By interacting with our rustic basket display, customers can pick up any soap, and evaluate the scent without any paper, plastic, or cellophane packaging to interfere. You can see the natural soap shades of the color spectrum range from brown to beige, cream to yellow, white and green. There are no surprises when you unwrap your ‘natural soap and find it is a vivid blue, purple or pink. Our unpackaged natural soap is less expensive than our wrapped soaps, and we pass those savings on to our customers, selling our unpackaged natural soap about 20% less wrapped soap. We also sell grab bags of our unpackaged soap, allowing people to sample our ‘factory seconds.’ We also sell bulk soap wholesale as well as retail. Customers can purchase soap logs or soap bricks to cut themselves at home, at their bed and breakfast or in their retail store. Our natural soap, as well as the way we sell it, is unique. The ingredients in our natural soaps will vary to some degree, depending on the type of soap made. All natural soaps are made with some kind of fat or oil, some kind of liquid, and of course sodium hydroxide or 'lye'. Most of us have heard our whole lives that oil and water don't mix. And they don't - Unless you change their chemical composition. And sodium hydroxide does exactly that. It changes the oil and water so that they can blend and become soap. Please make a mental note that although lye is one of the ingredients used to create soap, there is no lye left in our natural soaps! Lye is transformed in the soapmaking process, but is required for the soapmaking process. This is the one ‘chemical’ that is acceptable to find in the ingredient list for a natural soap. In fact, if it’s not there, chemicals and additives will have to be substituted. If that’s the case, it’s not a natural soap. Each individual soap listed on our website will include the ingredients used to make that soap along with a general description of the soap. If you buy our wrapped soaps, the ingredients will also be repeated word for word on the paper cigar bands the soap will come wrapped in. Any type of ground botanical added to our soaps, whether pine needles or poppyseeds, cornmeal grits or medicinal herbs, is included within the description. If no botanical is listed in a soap description, you can assume that the soap is smooth in texture with no exfoliant added. Botanicals, whether whole or ground, are considered natural soap ingredients. The ingredients a soapmaker uses to create their natural soap is an important thing to know, but with skin care products it is also important to know what is NOT used. We use absolutely no artificial colorants to make our soaps. The color differences you see in our soaps, from yellow to green to black or brick, are due to the ingredients themselves. We also use no artificial latherers – our terrific recipes contain our special proportion of natural oils that allow our soaps to lather wonderfully without need of chemicals. Our proportion of oils also dictates the ‘hardness’ of our bars of natural soap. We don’t add chemical hardeners of any type. Some natural ingredients will harden a soap, while negatively affecting a soap’s ability to clean, moisturize or rinse. Like Beeswax. Beeswax is a natural ingredient, but in our opinion, coating your skin with beeswax so water repels off your slick skin is not really what you’re looking for when you’re trying to learn all you can about natural soap. We also use no chemical preservatives in our soap. When you are evaluating whether or not a soap is truly natural, you do not want to see artificial or chemical colorants, hardeners, latherers or preservatives in the ingredient list. A truly natural soap will not have been made using those ingredients. There are many animal products that may be used in a soap, and allow that soap to be natural. We use Goat Milk in the 50 goat milk soaps we make, and lard in our Grandma's Ole Lye Soap because that's how it's been historically made. We also use a little lard in our Dog Soap because it adds shine and conditioning to the coat. These two soaps are the only soaps that use lard as an ingredient. If you don’t want to use products with animal products or by-products that is certainly your choice. But goat milk, lard and also tallow are not artificial ingredients, they are natural ones. Natural Soap = Natural Scent? Not Always! There are two ways to scent a soap - one way is completely natural and the other is not. If you truly want to select a completely natural soap, it is very important that you understand the following section and terms used. Essential Oil Natural Soap There is a 100% natural process that extracts scent from the flower, leaf or stem of a plant. This process results in what is called an Essential Oil, where the ‘essence’ of the plant is derived from it. An Essential Oil is a natural scent, so the words ‘Essential Oil’ are what you want to look for in an ingredients listing for a natural soap. Fragrance Oil Soap is Not Natural Soap Some scents cannot be collected naturally or may be too expensive to extract for soapmaking purposes. In that case, a Fragrance Oil is created in a Perfumer's Laboratory to simulate a scent. When you see a Fragrance Oil or Fragrance listed as an ingredient in a soap or skin care product, you should STOP because that means the ‘natural soap’ contains an artificial scent, not a natural scent. The wonderful fresh scent of candy canes! We make our Candy Cane Soap with triple distilled Peppermint Essential Oil, making Candycane a completely Natural Soap. Double-strength scented with eucalyptus, peppermint, and lavender to help ease your nasal passages and provide some breathing relief when you're feeling under the weather. Scented with Lemon, Lime and Blood Orange Essential Oils, our Citrus Shea Butter Face Soap is a 100% Natural Soap. The Herb Garden Soap Sampler is scented with five of the herbal and essential oil soaps we make, combining into a completely natural gift. With Lavender to calm you and Spearmint to cool you, this luxurious goat milk soap is made for rejuvenating baths and quiet times. Jock Itch Treatment Sample Bag with small size samples of our Black Walnut Anti-Fungal Salve, Tea Tree Anti-Bacterial Salve, and one full three ounce bar each of natural Tea Tree soap for Jock Itch, as well as our Lemon Tree soap. Our basic good-for-your-skin vegetable oil recipe of olive, coconut, castor and sustainably harvested oils with no fragrance added. Lavender Cream Goat Milk Soap is one of our bestselling goat milk soaps, using goat milk for its skin nourishing benefits and Lavender Essential Oil for its relaxing, natural aroma. 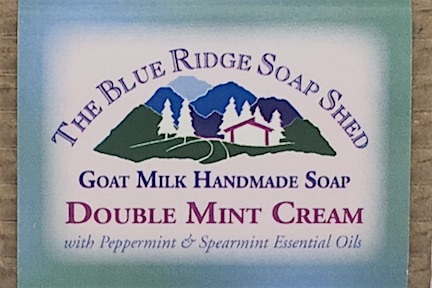 Lavender Spearmint Goat Milk Soap combines the relaxing soft floral scent of Lavender essential oil with the uplifting scent of Spearmint, making it a 100% natural soap. Yup, this is a 5-6 ounce chunk of Grandma's old lye soap recipe, made with lye and lard and nuthin' else, not even any of that sweet smellin' stuff that's in all the other soaps we sell. This is a 3 ounce bar of Grandma's old lye soap, made with lye and lard and nuthin' else, not even any of that sweet smellin' stuff that's in all the other soaps we sell. Natural dog shampoo soap for bathing your dog, with NO artificial or synthetic ingredients to cause allergic reactions or skin irritations. Natural Soap for Baby, a 100% Olive Oil Soap with no fragrance added.